WHO PERISHED IN THE FOUNDERING OF THE "MOHEGAN"
The SS Mohegan was a steamer built in Hull for the Wilson & Furness-Leyland Line who set off on 13 October 1898, en-route from Tilbury Docks, London to New York, carrying 57 passengers, 97 crew and 7 cattlemen. It was at 6.50pm on the evening of the 14th October, that the Mohegan ran onto the Manacles, embedding the rudder and tearing the hull open. The ship had struck Vase Rock before drifting onto the Maen Varses reef. Dinner was being served at the time, and many of the passengers were initially unaware of the severity of the accident. The Mohegan had taken a wrong bearing and sailed too close to the Cornish coast. James Hill, coxwain of the Porthoustock lifeboat saw the ship, lights ablaze, heading at full speed towards the Manacle rocks. With a cry of 'she's coming right in!' he called his crew. The ship rolled and sank 12 minutes after hitting the rocks, with the loss of 106 lives. Captain Griffith, Assistant Engineer William Kinley and all of the officers went down with the ship. Only her funnel and four masts remained above water. The Porthoustock lifeboat Charlotte was launched in 30 minutes and rescued most of the survivors from the wreck and the water. Most of the bodies of those who had drowned were recovered and an announcement in the national press invited relatives to come and view the bodies and if required take their the bodies home for local burial. For Clarence and Sarah Yeaxlee this would have been very difficult given their ages, the distances involved and the probable cost of transport. Whether they tried is not known but the Portsmouth Cemetery Office have confirmed that Nelson is not interred in the family grave. If therefore his body was one of those recovered he would have been buried in a mass grave in St Keverne churchyard. 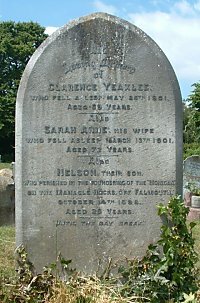 The church has maintained a record of those buried whose name could be determined, but Yeaxlees is not amongst them. A memorial stained glass window was given by the Atlantic Transport Line. It was the greatest disaster in the history of the company.